You’ve made it! Tasmania. Congratulations! This is the last place on Earth… next stop, Antarctica. You may have come across the world to be with us, or you may live just down the road. We humans are lucky to be able to go almost anywhere we choose. 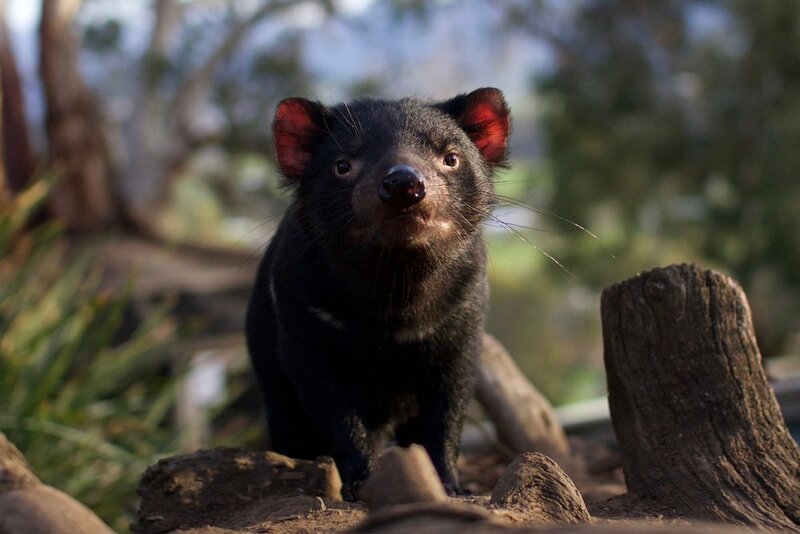 However, for many of the animals you will meet today Tasmania actually is the last place on Earth. Some of these species have never existed anywhere else. For others, Tasmania is a last refuge. They are the survivors of legions that once spanned a continent but now this little island bobbing on the Southern Ocean is all they have left. You may not know it but just by walking through our gate you become part of something special. Everything we do, we do with your help. You won’t know just how very welcome you are until you have met some of our animals and heard their stories of survival. Nothing makes us happier than introducing guests to our special animals. Nothing, that is, except seeing them go back to the wild. We operate Tasmania’s largest 24/7 Wildlife Rescue Service and our army of volunteers brings aid to thousands of suffering animals every year. This service is funded entirely by our entry fees. This means every time we rescue an animal it is because someone like you came through our gate. Bonorong is not a zoo – our aim is to get healthy animals back to the wild. All of them undergo meticulous assessment to ensure they are happy and healthy in our care, which is something we will never compromise on. Every single one of our animals has a story to tell. At Bonorong you will meet animals that are extinct everywhere except our island refuge. Our ever-changing menagerie of survivors includes wombats, devils, quolls, native birds, koalas, lizards, snakes and emus. He came to work at the then park as a young wildlife keeper and quickly worked his way through the ranks to become manager. By twenty-five years old he had achieved his dream of owning the business when the previous owners decided to pass the baton on to him. For Greg, Bonorong is a means to help Tasmania’s fragile wildlife and ecology. Since he arrived, Bonorong has changed from a traditional, 1980's era wildlife park to an innovative and active Wildlife Sanctuary. The Sanctuary is focused on giving back to the Tasmanian environment, rather than simply being a showcase. Bonorong is a social enterprise – a little business with a biiiiiig heart. We run a successful tourism enterprise which provides eco-education and experiences for each guest. Our skills and the funds generated through the Sanctuary allow us to proactively address problems in our surrounding environment and communities. Part of our mission is to facilitate community solutions to community problems. Bonorong is an open house and we try to provide pathways for all Tasmanians to become involved in conserving our unique natural heritage. At the heart of this is a belief that in the same way an individual can devote their existence to doing good, so too can a business.